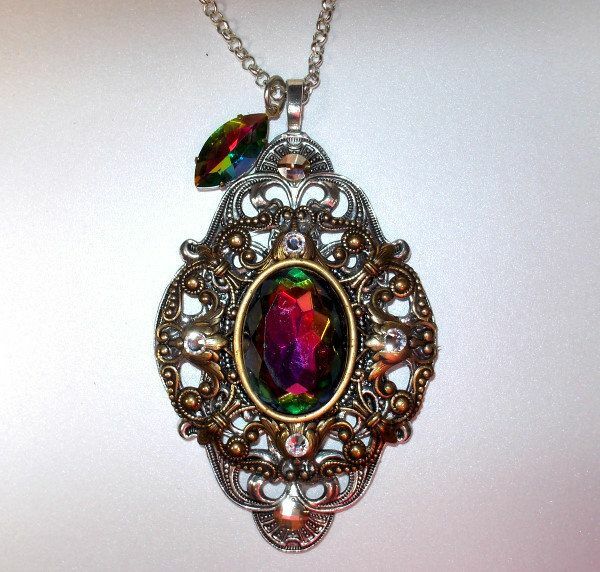 This is a totally bling vintage style pendant! The centerpiece is a 25 x 18mm Volcano colored rainbow Austrian crystal. The color is that of a jewel-toned rainbow that changes as you move it from side to side! A camera just can't capture its beauty! The brass filigree is mounted on a silver plated solid brass ornate filigree setting that is a very large 3.25 x 2 inches. I placed clear and champagne colored Swarovski crystals in the setting. It also has a Volcano colored long marquise cut crystal charm. It comes on a 24 inch sturdy gold plated chain with a lobster claw clasp.